There are many people who need to know how to take care of their refrigerators. As a homeowner, you may be wondering what you need to do and learn to keep your refrigerator in good running condition and avoid calling out for refrigerator repair services. Whether you are curious about Kenmore refrigerator maintenance tips because you have this brand of appliance in your home, or maybe you are a landlord in need of help maintaining your rental property, there are a few things that you should know to maintain your Kenmore refrigerator. The first and easiest thing that you can do to make sure your refrigerator is running at its best is to make sure that the water filter is changed on a regular basis. Of course, if you do not own a refrigerator with a water dispenser this not information you will need. In order to find the proper filter, take some time to read through the owner’s manual. The water filter should be replaced at least once a year to ensure that it is cleaning your drinking water properly. This may not seem like it is one of the top Kenmore refrigerator maintenance tips, but it important that you dispense clean safe water from your refrigerator. Another thing that you can do to maintain your Kenmore refrigerator is to check your condenser coils often. These coils play a very important role in making sure that the appliance is doing its job of cooling your food to the proper storage temperature. They take the heat away from the interior of the refrigerator and release it, similar to a radiator. This means that the coils should be free from any dust or dirt. When you are checking the coils, take some time to clean them off if needed. Knowing this and other Kenmore refrigerator maintenance tips will get you on your way to becoming an expert on maintaining a refrigerator. The last thing you should consider when checking out Kenmore refrigerator maintenance tips is how to set the temperature in the freezer compartment of your refrigerator. While many people think that the lower the temperature, the better the freezer will work, that is not always the case. 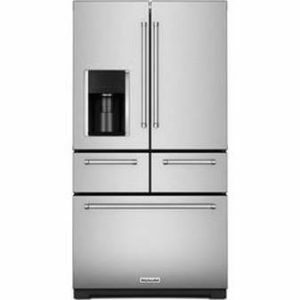 The optimal temperature for a freezer that is part of a refrigerator is below 10 degrees and above 0 degrees. This will keep your food cold and frozen, but will prevent you from unintentionally freezing other parts of the unit including the tube that carries water to the dispenser. Hopefully you have found these Kenmore refrigerator maintenance tips helpful. There are many other things you can do as well to make sure you are getting the most from your refrigerator. Remember to check the seal on your doors to ensure it is sealing properly every time it is closed. And keep the unit as fully stocked as possible so it doesn’t have to cool as often. Both of these Kenmore refrigerator maintenance tips will help you run your refrigerator as efficiently as possible and hopefully save you a few bucks as well.